KAG by Acusafe is a leader in safety rails. The patented swage technology employed in rail design has been proven to increase grip by up to 80% in the wet, 160% in the dry and 300% in oily conditions. Blending style with safety, KAG is the intelligent solution to enhance safety and prevent slip-fall injuries. KAG safety rail system is also available with fibre-optics lighting options to provide sustainable lighting alternative. 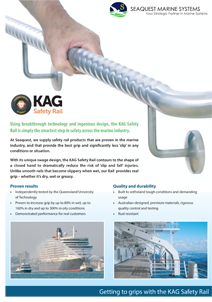 Seaquest Marine is proud to be the wordwide distributor for KAG in the marine industry, check out KAG Safety Rail in navigation for new product updates.